“I was one of the hundreds of visitors to the "Patchings" Art Festival in Nottingham last year (2012), and during my "wanderings" I stopped at the Alpha Painting Holidays Stand. I picked up some of the literature, to read later, and I also completed one of the questionnaires, which I folded and popped into the box for the chance to win a holiday. As the weeks and months passed I totally forgot that I had done this, so you can appreciate my surprise and absolute delight when I received a telephone call from Gill in December, to tell me that I was the lucky winner and I could choose a holiday from the programme! 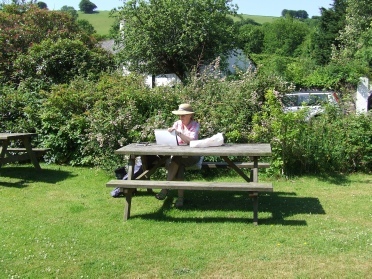 The holiday that I decided upon was four days on Exmoor, painting "Cottages, Water and Moorland" staying at "The White Horse Hotel" in the village of Exford with Tim Fisher as the tutor. Our group comprised of ten very keen students who, after the initial introductions had "broken the ice", were quickly chatting and laughing together! Gill explained the programme for the four days and handed out details of the locations. She had also set up a materials table stocked with art equipment so that if we had forgotten to bring anything or were running short of a particular product, we could buy it there and then. "The White Horse Hotel" was in a super location in the village with a private garden next to the river where guests could enjoy a cream tea in the afternoon or a cool drink in the evening. The staff were extremely friendly and helpful and really made you feel welcome, and the choice and variety of the menu was excellent and the portions were very generous indeed! Each morning Gill made sure that the transport arrangements suited everyone so that we could share cars to travel to the various locations, and provided maps (just in case we lost our way!). She also brought folding chairs and boards,and bottles of water for each of us as the high temperatures and brilliant sunshine meant that we all needed some cool liquid refreshment by mid morning! At each location we had time to explore the area before deciding on the specific viewpoint that we wanted to draw or paint and Tim would gather us around to watch him demonstrate either in the morning or delay this until after lunch if that suited us better. During the morning Gill walked around the location to find each one of us to take our orders for morning coffees and lunch, and brought these on trays from the nearby National Trust Tea Rooms or the village hostelry! What service! And she didn't even want a tip! Throughout each day Tim was kept busy by offering each one of us advice and support to ensure that we all progressed and managed to complete, or nearly complete a piece of work that we were pleased with. The highlight for me on the third day was that a couple of people on holiday from Scotland liked my painting of " Withy Pool" so much that they asked if they could buy it from me! How could I refuse such an offer! On our final evening we assembled in the large "studio" in the hotel and displayed our paintings and drawings and Tim took time to give us a useful and positive appraisal on each piece of work. It was interesting to see how each one of us had progressed and produced our individual interpretation of the Exmoor landscape.